Senator Ted Cruz condemns rocket and mortar attacks on Israel, says Hamas and other terror groups in Gaza must be defeated. U.S. Senator Ted Cruz (R-TX) on Tuesday condemned the rocket and mortar attacks from Gaza toward southern Israel. “Today Iran-backed Palestinian terrorists like Hamas launched over 100 rockets and mortars at Israel. They attacked in the morning as Israeli children were walking to school. These attacks came after months of using Palestinian human shields as cover for other attacks on Israel,” tweeted Cruz, who specifically referred to a mortar shell that exploded near an Israeli kindergarten in southern Israel which miraculously was empty at the time. “I unequivocally stand with Israel and support Israel’s actions to defend itself. The media must cease its mendacious coverage blaming Israel for Gaza violence, which rewards Hamas for its barbaric tactics. Hamas and other terror groups in the Gaza Strip must be defeated,” he added. Earlier on Tuesday, the United States called for an emergency meeting of the UN Security Council to discuss the latest attacks on Israel out of Gaza. “The recent attacks out of Gaza are the largest we have seen since 2014. Mortars fired by Palestinian militants hit civilian infrastructure, including a kindergarten. The Security Council should be outraged and respond to this latest bout of violence directed at innocent Israeli civilians, and the Palestinian leadership needs to be held accountable for what they’re allowing to happen in Gaza,” said the U.S. Ambassador to the UN Nikki Haley. The Security Council will meet on Wednesday to discuss the rocket attacks. The United States is expected to demand that the council condemn "in the strongest terms the indiscriminate firing of rockets by Palestinian militants in Gaza" toward Israel. The IDF responded to the continuing rocket attacks with a series of airstrikes against terrorist targets in Gaza. At least 25 Hamas targets were hit on Tuesday night, including sheds of drones used for terror purposes, a rocket manufacturing workshop, advanced naval weaponry, military compounds, training facilities, and a munitions manufacturing site. 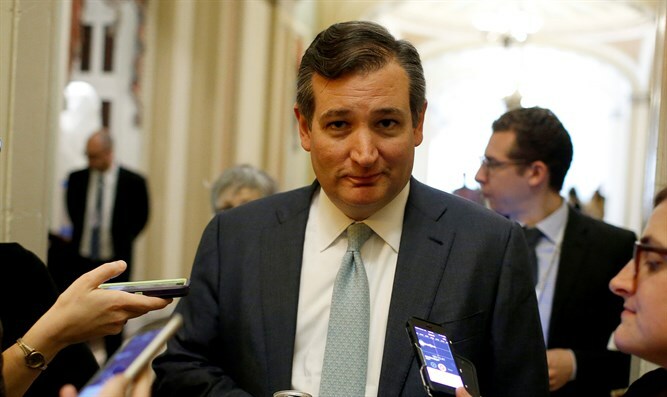 Cruz, a staunch supporter of Israel, recently ripped the media for its bias against Israel and expressed his unequivocal support for Israel’s right to defend itself against Hamas’s recent attacks on Israel's border.